In the evenings, I pause in my chores to take the cat on a supervised trip into the back yard. She’s proven time and again she can’t be trusted not to jump over the wall and go walkabout—which, I suspect, is how she got lost from her previous owners. She does so love the back yard. She’s quite insistent on going out, fussing and whining until I relent. I always relent, because my dirty little secret is that I go out there as much for myself as her. Min makes a great excuse. I love to feel the wind in my face, listen to the birds, watch the gloaming slowly overtake the leaves of trees and plants, golden and syrup-rich. I love the sense of presence out there. It’s serene, one of the few things in my life right now that fills me up rather than takes away. So as I sat in my serene place last night, I thought—mostly in a peaceful way—about letting go of so many layers of things. Letting go of fears, letting go of needless guilt and worry, of giving it up to the inexorable ebb and flow of the universe. Not give up on life, you understand. Still in there, still fighting the good fight, just reconciling myself to the fact that the universe will always have its way in the end, no matter what I or anyone else does. What I needed, what I need, is to give up the illusion of control, to make peace with that. We’re none of us helpless flotsam in the grand old river of the universe. I truly believe things travel along with us, keeping us in the free-flowing stream as long as possible, as much as possible. Little markers of hope and fellow-feeling, sometimes larger things that buffer and stand guard. At times, the smallest things can bring the largest upwelling of hope, allowing us to float free. I don’t know what these things are, where they come from, wouldn’t care to define them in narrow human terms, but they are there as long as we allow them to be. We can’t be protected forever. Nothing can be. Sometimes we’re going to smash into rocks, sometimes we’re going to dip below the surface. Sometimes, when the time has come, we’re going to drown. It’s the nature of the journey. It’s easy to be philosophical about all this when I’m in my serene place. Difficult when I’m having trouble treading water. From the perspective of my usual chair last night I tried to think of some better way of treading water. I wondered if, along with the illusion of control, I also had an illusion of receiving help along the way. I looked at a patch of ground near the bird bath where a few days ago I’d moved a brick that had been overgrown with moss. I saw a little face, tilted to the side, peering back at me from the fringe of the moss, just before the precipice where the brick had nestled. One little arm was raised as if she swam hard against the pushing tide of moss. I was far enough away to wonder if she might be an optical illusion, a trompe l’oeil composed of bits of leaf matter, blossoms, and hope. 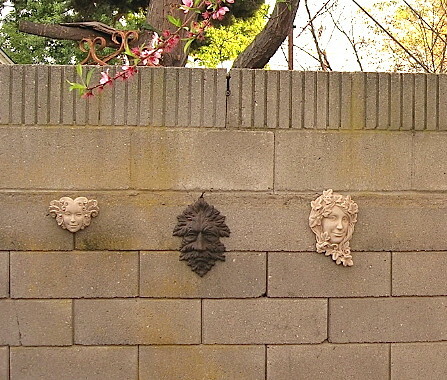 I looked up at the faces hanging on the garden wall. Flora and Ivy smiled serenely back at me. Green Man looked grumpy, as always, but I wouldn’t absolutely swear there wasn’t a twinkle in his eyes. Probably the gloaming. Magic always happen in the heavy, rich light of twilight. This post was originally written in July of 2011 when I was struggling with being the sole caregiver for my 90-something mother. I am no longer a caregiver, but the idea that something will be there for us when we need it most remains a great comfort to me. In the evenings, I pause in my chores to take the cat on a supervised trip into the back yard. She’s proven time and again she can’t be trusted not to jump over the wall and go walkabouts—which, we suspect, is how she got lost from her previous owners. She does so love the back yard. She’s quite insistent on going out there, fussing and whining until I relent. I always relent, because my dirty little secret is that I go out there as much for myself as her. Min makes a great excuse. I love to to feel the wind in my face, listen to the birds, watch the gloaming slowly overtake the leaves of trees and plants, golden and syrup-rich. It’s serene, one of the few things in my life right now that fills me up rather than takes away. I looked up at the faces hanging on the garden wall. Flora and Ivy smiled serenely back at me. Green Man looked grumpy, as always, but I wouldn’t absolutely swear there wasn’t a twinkle in his eyes. Probably the gloaming. Magic things always happen in the heavy, rich light of twilight. You are currently browsing the archives for the the gloaming	category. WordPress 5.1.1 and delivered to you in 0.884 seconds using 30 queries.